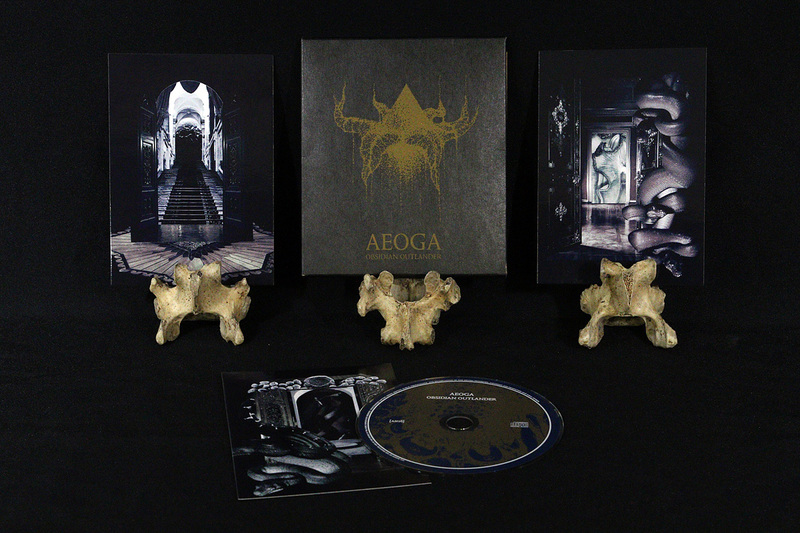 Aeoga is a solo project by Antii Haapapuro, one of the founding members of the Aural Hypnox label. He is also part of other Aural Hypnox projects including Arktau Eos, Halo Manash and I.Corax. Beginning in 2004, Aural Hypnox entered the dark ambient / ritual ambient industry of music. Surrounded by labels like Cyclic Law, Malignant Records and Cold Meat Industry, Aural Hypnox made a name for themselves with their uncompromising attention to uniqueness and detail as well as a rigorous do-it-yourself attitude. 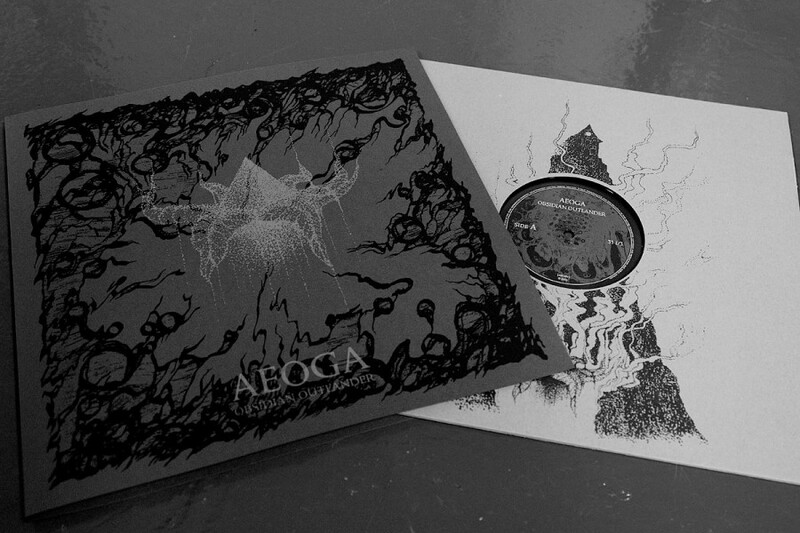 Beginning with their debut, Coav: AH02, Aeoga set about on their mission “To exhaust mind and body in order to obtain a condition of non-consciousness and thus receive, realize and create material based on both primal and absent vision”. Over the following decade Aeoga would continue to adhere to their primary goal and simultaneously improve upon their musical performance. 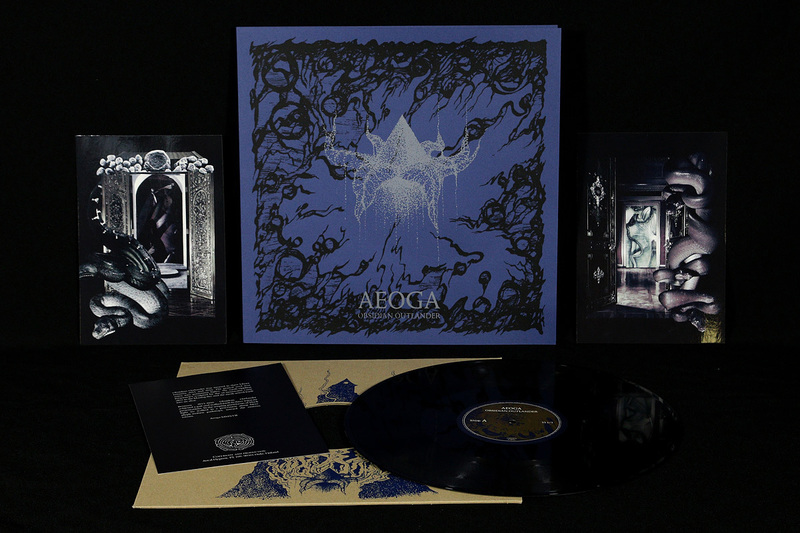 Now with their latest release, Obsidian Outlander, Aeoga break new ground as the first project on the label to release an album in the vinyl format. It should be little surprise that this vinyl release is beautifully realized and given all the care and attention expected of an Aural Hypnox release. The vinyl edition comes in two variants: gold or the more limited silver variant. The album, in its vinyl or CD versions, comes with three art prints with text about the album on their reverse sides. The album opens with “Initiatory Boil” which incorporates rattling chains, ominous pads and a variety of other field recordings to set the tone and atmosphere for the album. “Rot-Magnetism” follows with manipulated loops that create a dream-like atmosphere, which bring to mind the works of Kammarheit. These loops are built upon with field-recordings of strange mechanical noises which give the track a duality of super-natural and industrial influence. Treated voices are heard emerging from the background, as if lost souls are calling from just beyond the void, reaching out to the musician as the lines of his craft are blurred, between the creation of music and the strong ritual presence, which drenches all releases on the Aural Hypnox label. “The Black Loom” and “Obsidian Towering” take a more traditional ritual ambient role than the rest of the album, using chants and tribal drums to build their foundations. Whereas we were previously winding through mystical realms residing outside the laws of space and time, these two tracks ground us in our earthly haunts. The minimal nature of these tracks do not take away from their potency. They work as a captivating bridge between the two halves of the release. “Outer Observatory” is one of the highlights of the album. Gently morphing synth, melts into distorted dronework and minimalistic field recordings to create an atmosphere that could be considered the most straight-forward dark ambient on Obsidian Outlander. The shifts in intensity take it from subdued soundscapes into harsher territories reminiscent of Yen Pox. The beauty is in the masterful handling of these dynamics, moving between two opposing elements, without any clashes in atmospherics. While Aural Hypnox has long been known for the quality and craftsmanship of their CD and cassette releases, Obsidian Outlander gives us the first taste of what to expect for the future of Aural Hypnox. The enthusiasm in the market for vinyl releases has made it possible for many of these smaller but well-established and respected labels to take the plunge into this format. The Obsidian Outlander vinyl comes in a beautiful and unique package and I can only imagine what Aural Hypnox will come up with for coming releases to keep delivering on their mission to create premium physical releases in this medium.